Polka Dot Overload | Sewing, knitting & vintage projects, tips, tutorials and cartoons! : Finished: My Purple Sheepy Soaker Wool Diaper Cover! 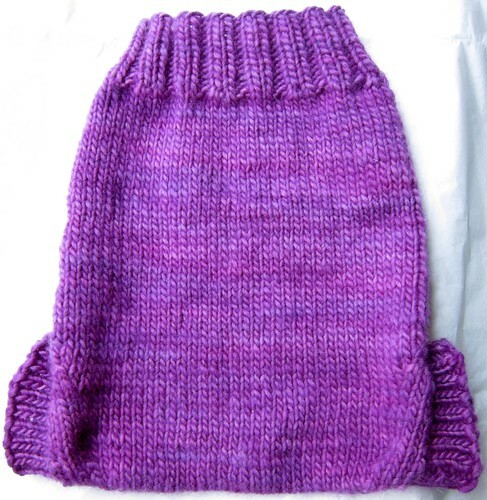 Finished: My Purple Sheepy Soaker Wool Diaper Cover! Exhausted, pregnant and laid up in bed as I have been lately, I needed a quick little creative project that did not involve being hunched over a sewing machine or cutting table. So after my successful yarn de-stashing, I examined what I had held onto and decided to make some small, easy baby things. ... but I found I was too darn tired to deal with even such a simple lace pattern. I knit the yoke no problem, but after knitting and ripping back the first few rows of lace four or five times I realized I needed something more mindless. Enter the Sheepy Soaker! I had always been puzzled as to all the wool diaper covers I saw on my favorite knitting blogs, cute and ruffly as they were--why wool? Wouldn't it leak? Wouldn't it be hot and itchy for babies? IMG_6350, originally uploaded by beryldrue. ...but we needed a little Cloth Diapering 101. We wanted to get a sense of cloth diapering as a whole, what types are out there, how to properly wash them (especially since we live in an apartment building with shared laundry in the basement), how to deal with them while out and about, etc. Many of the newer diapers (including quite a few of the ones my mom made, like the blue one in the above photo) are all-in-ones. With an absorbent lining sewn inside a waterproof outer layer made of PUL or the like, they're as easy to use as disposables (aside from the extra laundry). And then there are diapers made of absorbent materials like cotton, hemp or flannel--they could be foldeds, prefolds, fitted or contour style, but they all need an additional waterproof cover. Said cover could be made from PUL, fleece, nylon--or wool! Apparently, wool diaper covers (often known as "soakers" or "longies" if they're pants-length) are the king of cloth diaper covers. The class instructor could NOT say enough good things about them. Unlike synthetic materials, they're breathable, and actually a great choice for summer-time diapering. In its natural state, wool is waterproof thanks to the lanolin from the sheep, but it can also be regularly re-lanolized (using Lansinoh cream, even). Weirdest of all, it requires infrequent washing, because when baby urine meets lanolin, it produces some kind of chemical reaction that neutralizes the pee and turns it into soap. Great, right? But commercially-available wool diaper soakers are mad expensive, often starting at $35 each or more. Even with a soft merino wool yarn like Malabrigo, I figured I could make the same thing with about $6 worth of yarn... already handily available in my stash! 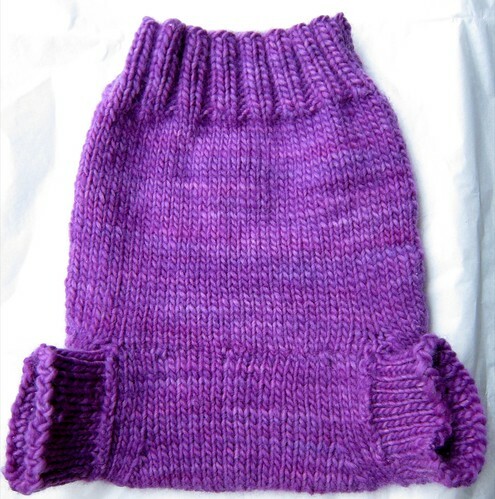 Pattern: The Sheepy Soaker, available as a download for $5.75 from Sheepy Time Knits. It's an extremely detailed but easy pattern with 16 pages of photos and instructions for soakers in a variety of sizes and styles. It's knit in the round with no short rows (just some ribbing and a gusset). Sizing: I skipped the newborn size and made a small for maximum versatility. I think I may have made it a bit too deep in length, but we'll see. (Update: I emailed with the pattern designer and I did indeed misinterpret her pattern instructions--it's about 1.5" too deep, so I'll have to come up with a fix). Yarn: Malabrigo worsted merino in "polygala" (purple). SOOO soft! Needles: The pattern recommends a gauge of 5 stitches to the inch, which I got using size 6 needles. I used size 4 for the ribbing on the waist and legs. I've also made the project details viewable on Ravelry, even if you're not a member. P.S. For you non-knitting sewing moms out there, you can also sew wool diaper covers from old sweaters! P.P.S. If you're wondering what the answer was regarding washing the cloth diapers--while baby is exclusively breastfed, you just throw them in a diaper pail and every few days you wash them once in cold water, once in hot water (using a diaper-appropriate detergent), and then dry. If baby is getting formula or solid foods, you have to shake the solids into the toilet first (or rinse them out with a diaper sprayer or the like) before washing. Lovely. What a great project to do when you need to have your feet up. Take care. WE HEART WOOL DIAPER COVERS! 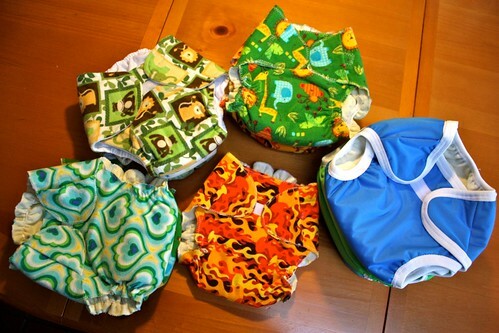 See http://inderlovesfolkart.blogspot.com/2010/03/cloth-diapering-for-busy-tired-people.html. The Aristocrats "large" size has lasted us months and months, and shows no sign of being too small - after six months, baby's growth sort of levels out, and they get skinnier and longer, but not really bigger. I usually wash mine only when they are, ahem, "soiled" or start to smell like pee. And I generally relanolize them at that time. Warning: They take FOREVER to dry. I mean, days and days, even sitting above our heating grater. So you need like three in rotation if you are using them every night. I meant "heating grate" but "grater" is funnier. I love my cloth diapers! I made a lot of my covers from sweaters since I am lacking in knitting skills. My daughter cannot abide with completely waterproof covers, they give her a rash in a few wet diapers. 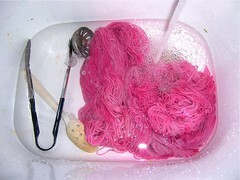 Just a tip, if you use wool they will feel damp after wetting. If your baby's pants are too tight in the crotch the urine will wick through the cover to the pants. Oh, and VERY CUTE cover, I love that color of purple. I am actually really liking using cloth diapers (especially since I've been reading negative stuff about the new Pampers causing awful diaper rash). My husband is allergic to wool, so I've been hesitant to try the wool covers in case the little one is sensitive too but I hear they are fantastic. Plus, what a perfect project when you're low on energy! Have a look at Elimination Communication, to reduce the amount of diapers used!! Having said that, we used cloth for my daughter, who is now 2 and completely diaper-free (due to EC)-and I NEVER washed the diapers twice. Hot wash, with an extra cold rinse. No fabric softeners, mild detergent with no perfumes or dyes. That's it. Never a rash, or a problem with leaks or whatnot. My mom used cloth diapers and did one hot/bleach wash, first removing any solids into toilet. To shorter the soaker you could cut out the extra and graft or 3 needle bo the ribbing and soaker body back together. Or just fold over the ribbing, that might work too. The whole wool diaper cover thing is fascinating! Thanks for all the helpful comments! Summer, I may indeed do that... but I'll probably just be lazy and fold down the ribbing, maybe run some elastic thread through both layers. Next time I'll make the correct rise. Finished: My No-Pattern Reversible Shirred Skirt!